Julie Grey was J.R.'s first secretary and although she lasted only 5 episodes, she was one of classic Dallas's most memorable women. Julie was a tragic character: initially loyal to J.R. with whom she was having an affair, Julie later betrayed J.R. to Cliff, an action that ultimately let to her demise when information she had safeguarded became known to members of the oil cartel. 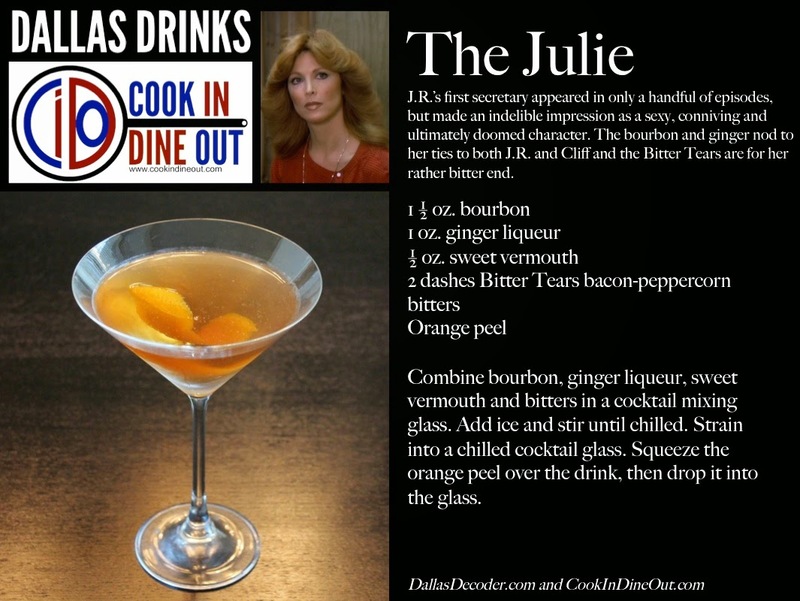 Julie's drink recognizes her ties to several of the show's main men: bourbon for J.R., ginger liqueur for Cliff (which also nods to actress Tina Louise's best-known role as ginger on Gilligan's Island), and sweet vermouth ties her to Jock, with whom she had a friendship. The Bitter Tears are a reminder of Julie's tragic end. Combine bourbon, ginger liqueur, sweet vermouth and bitters in a cocktail mixing glass. Add ice and stir until chilled. Strain into a chilled cocktail glass. Squeeze the orange peel over the drink, then drop it into the glass.